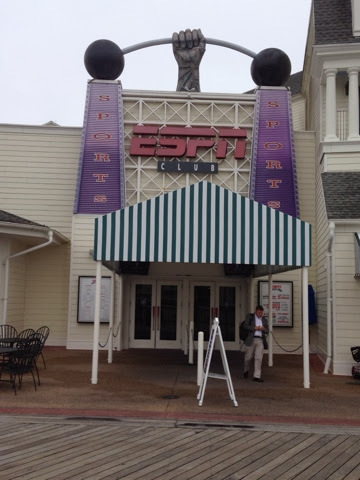 When I returned to Leesburg my social secretaries (mom & aunt) told me that the meeting they had planned with one of their friends for me to meet on Wednesday at "The Villages" was changed to Thursday and Wednesday would be lunch on Disney's Boardwalk ESPN. So this am we were off to Disney. Me coffering mom & aunt in the baby blue Grand Marque. I have been to the Boardwark before so I kind of knew how to get there and the layout. Cousin Robbie (aunt's grandson) works at Disney's ESPN restaurant. Every couple years he moves to a new job. His brother John and his wife were also in town. John has just retired too but younger than me. Also in town was cousin Michael (mom & aunt's sister's son) and his wife. Michael is also retired and a bit older than me. The eight of us had one of the nicest lunches and after Cousin Robbie had to stay at work, the rest of us went to the Boardwalk Hotel Lobby and sat and talked. What a bonus day this was for me. It rained all day so I wasn't going to do anything and it was replaced by a lunch and meeting of people that hardly ever see each other, never mind all together. It was back to Leesburg late pm as it is an hour drive to Disney. This evening I worked on my course I am teaching at MWCC & wrote a belated email to my friend Michel in Frace. He had written me a few weeks ago but had been to busy to reply before now. Michel is also retired. We worked together at Digital in Annecy, France in the Alps.